Hello! This weekend I did a lot of hanging around the house and COOKING. I got the latest issue of Bon Appetit and it was a Thanksgiving special. It had tons of choices of menus for the big day and since I'm cooking for 16, I couldn't wait to try some out. But first lets start from the beginning. Thursday night I was going to make Deep Dish Pizza but Dave was in the mood to go out to eat so I saved the pizza for Friday night. By Friday, my dough (which I purchased on Sunday) was pretty flat so it was hard to get it into a cake pan... so I just made a regular pizza. I basically put whatever vegetable was left in my fridge on this pizza. 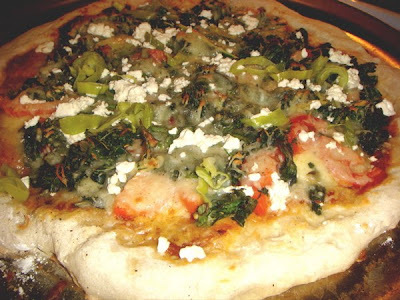 A layer of sauce, hot pepper cheese, kale, tomatoes, banana peppers, mozzerela and feta cheese...mmmm. I had about three pieces. 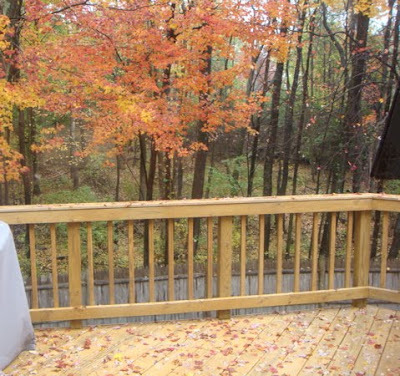 Saturday, I woke up to a beautiful view in my backyard. Tons of folliage. It was a pretty lazy day. The highlight of my day was going through Bon Appetit and picking out what dinners I was going to make for the week and what Thanksgiving recipes I was going to try. Dave says I look like I'm studying for a test when I look through the magazines and watch cooking shows while making my list : ) I went grocery shopping in the early afternoon and got going preparing dinner by 5 pm. I skipped a workout because my leg was feeling pretty sore from all the electric stim I got on Thursday in Physical Therapy. 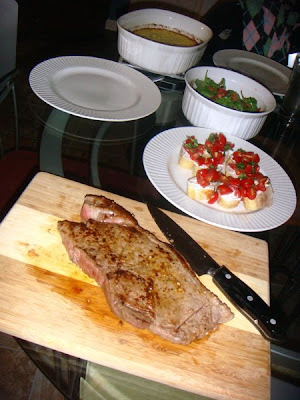 Saturday's dinner was NY Strip Steak with a Bacon, Tomato and Argula Salad along with Corn Pudding from Bon Appetit. 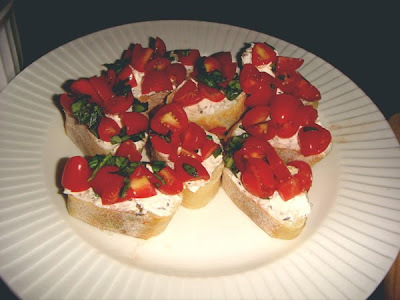 In addition, I also made Goat Cheese Bruschetta. First I diced the tomatoes and the basil and put them in a bowl and seasoned with EVOO, Balsamic Vinegar and S&P. Then I spread the cheese on the bagette and topped it with the tomatoes. 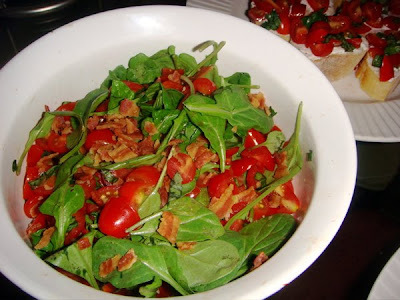 Next I took the reminder of the cherry tomatoes, and threw it in a bowl with Argula, bacon and a dressing of Balsamic Vinegar, EVOO and Salt and Pepper. 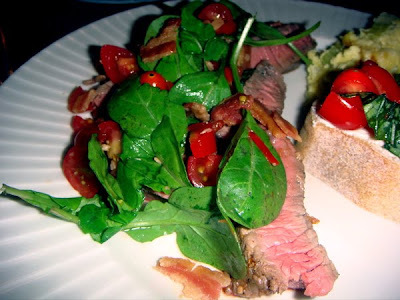 This salad went over my NY Strip which I pan-seared with EVOO, garlic and S &P. Cooked for 4 minutes on each side then let it rest and it was the perfect Medium Rare. 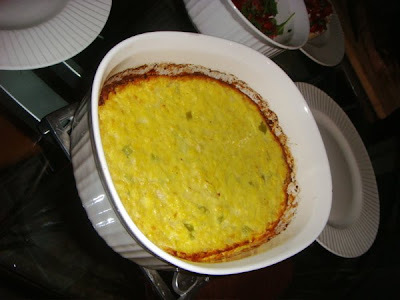 I also made Corn Pudding which was sooo tasty and so different. 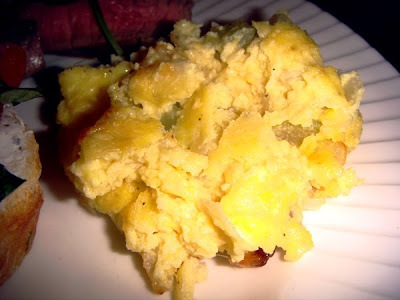 It looked exactly like scrambeled eggs, but tasted like sweet, delicious fresh corn. Here is the recipe- definitely check it out. This will definitely be used for Thanksgiving dinner! Dave and I liked this a lot, but we thought it could use a little something extra. Maybe bacon or chipotles? I may have to try it out again before the big dinner. What a meal! For dessert, I made something simple. I made a Graham Cracker crust by mixing food processed graham crackers with butter in a pie dish at 350 in the oven for 10 minutes. Then I made chocolate mousse from a package and topped that with cool whip. Perfect light(er) dessert. Tonight, I made Butternut Squash and Cheddar Bread Pudding from Bon Appetit, Grilled Chicken with Silky Squash Gravy, and Creamed Sweet Potatoes. 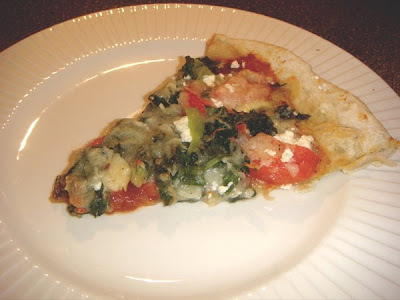 The best part about the pudding was that it included some of my favorite things: crusty bread, kale AND cheese! This recipe was delicious. 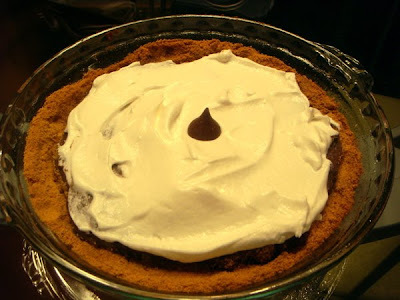 Another definite menu item for Thanksgiving. Preheat oven to 400°F. Toss squash with 1 tablespoon oil on rimmed baking sheet. 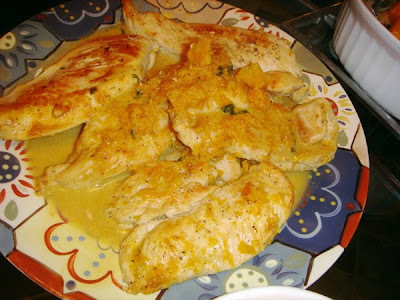 Sprinkle with coarse salt; bake until squash is tender, turning with spatula occasionally, 20 to 25 minutes. Whisk eggs in large bowl. Add half and half, wine, mustard, and 1 1/2 teaspoons coarse salt; whisk to blend. Add baguette pieces; fold gently into egg mixture. Let soak 30 minutes, stirring occasionally. Meanwhile, heat 2 tablespoons oil in large pot over medium-high heat. Add shallots and sauté until soft, stirring frequently, about 5 minutes. Add kale; cover and cook 2 minutes. Uncover and stir until kale is wilted but still bright green, about 5 minutes (kale will be a bit crunchy). Reduce oven temperature to 350°F. Generously butter 13x9x2-inch baking dish. Using slotted spoon, transfer half of bread from egg mixture to prepared baking dish, arranging to cover most of dish. Spoon half of kale over bread. 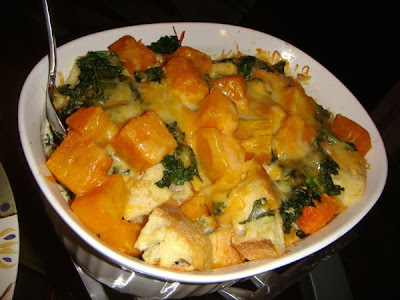 Spoon half of squash over bread and kale; sprinkle with half of cheese. Repeat with remaining bread, kale, squash, and cheese. Pour remaining egg mixture over bread pudding. Cover bread pudding with foil. Bake 20 minutes. Remove foil; bake uncovered until custard is set and bread feels springy to touch, about 20 minutes longer. Preheat broiler; broil pudding until cheese browns slightly, about 2 minutes. Cool 5 minutes and serve. 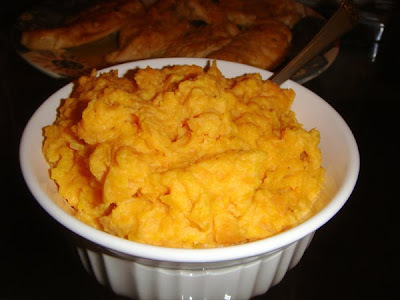 The creamed sweet potatoes were made by boiling 1 inch pieces of sweet potato, straining them and mashing them with cream and butter, lime juice and S&P. I don't really like Sweet Potatoes so this is a hard judge for me. Dave seemed like he thought they were just okay. What Dave really loved was the Chicken and the sauce I made up on the fly to go along with it. 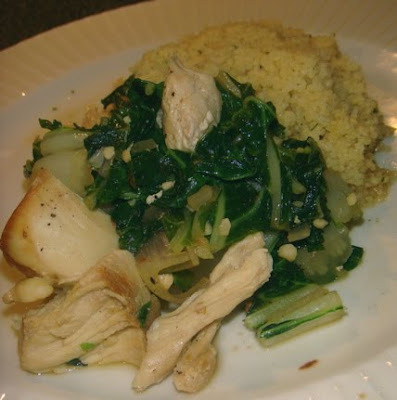 I sauteed chicken in a hot skillet with EVOO, S&P. 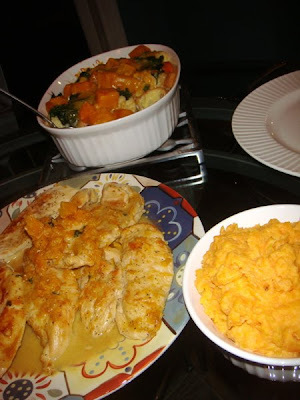 Once browned on both sides, I combined some mashed squash with chicken stock, a little cream and S&P. Pretty tasty. Now I'm on the couch still digesting. Lots of leftovers for lunch for the week! 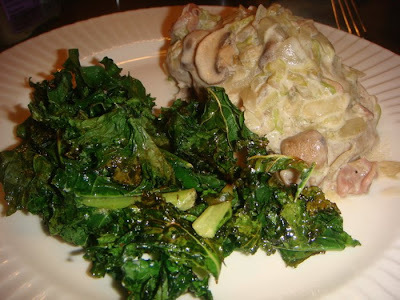 On the side I made Creamy Kale by taking 3 cups of Kale and sauteing it in a skillet with a little EVOO. Once wilted, I added a handful of Mexican blend Cheese, a tiny bit of cream, a little veggie broth and some banana peppers and some S &P. This is seriously so addicting. Actually, I have some leftover for lunch today! 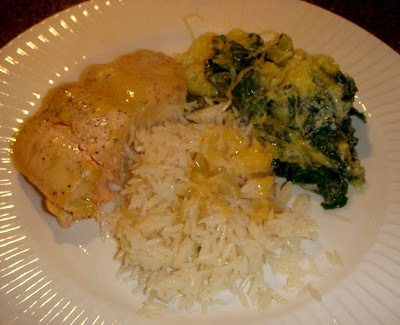 I also served the Salmon with Uncle Ben's microwavable Jasmine Rice and of course more mustard glaze! So, because I made a pound and a half of Salmon or about 6 small fillets, I had lots leftover. After the fish cooled, I flaked it off the skin into a glass bowl for Tuesday nights dinner of Asain Salmon Cakes. But we'll save that recipe for later in the blog entry. After we enjoyed dinner, I got to work on baking. 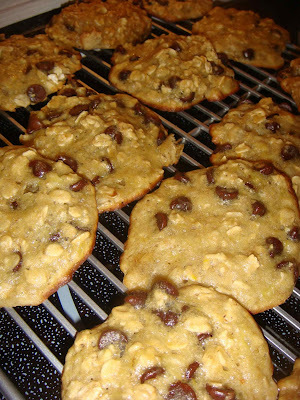 I had two completely ripe bananas so I wanted to make some Banana-Oatmeal Chocolate Chip Cookies from this recipe. I made 1 dozen of these cookies. Now on to last night's dinner. 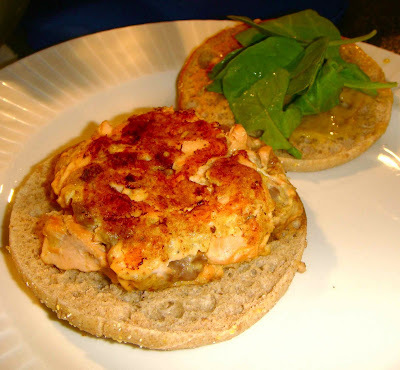 I decided to make both the Salmon Cakes I had planned, as well as the dinner I had planned to make Wednesday. Sometimes it's easier to cook once and eat twice, especially since tonight I don't have to cook! So first the Salmon Cakes. 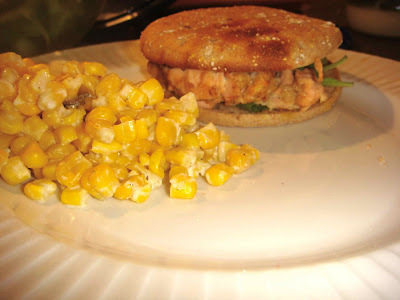 I took the flaked over salmon and combined it with the ingredients listed above. Then I added the cakes to a hot skillet and cooked for 3-5 minutes on each side. I made more honey mustard sauce and put that sauce on the Arnold Wheat Thin with some Argula. For a side, I made my quick version of Creamed Corn. Used a bag of Steamed Frozen Corn that I steamed in the microwave then added it to a hot skillet and combined 1/8 Cup of cream with 1/8 cup of sour cream with salt and pepper. 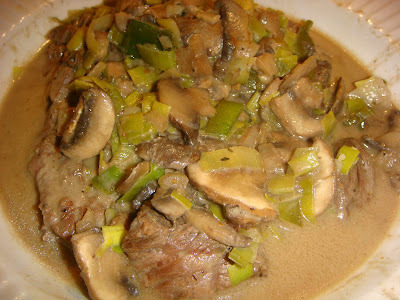 In the skillet next to the cakes, I prepared Steak Tips with a Mushroom, Leek Cream Sauce. First I added 1 tablespoon of EVOO to a hot skillet and added the marinated meat and cooked for 6 to 8 minutes until browned. Then I transfered the meat to a serving bowl and covered with foil. I then added the mushrooms and leeks to the skillet and cooked until soft. Then I added the broth, thyme and salt and pepper and let it reduce. Finally, I lowered the heat and added in the sour cream and mustard and poured it over the meat. 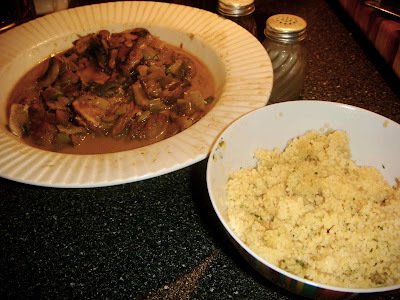 We will enjoy this tonight with the Couscous I made... yum. Monday- PT was great, wish I was going to this guy the whole time. I think I will definitely be injury free in a month with all the excercises, stim, heat, icing I am doing! Wednesday- PT in the AM with eliptical and stairclimber intervals. My physical therapist wants me to try running this weekend. Just ten minutes around a track but he wants me to feel it out. Pretty excited about that! 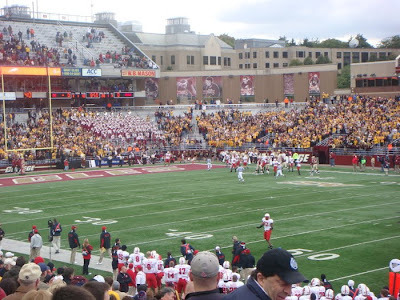 On Saturday, we went to the BC game. It was absolutely freezing but we had amazing seats and it was a really fun game. Before the game, I went to the gym for an hour long spin class that was one of the worst classes I've ever taken. The music was terrible but I tried to imagine I was somewhere else and tried to get into as much as I could. After the class, I lifted my legs, did my hip excercises and stretched, a lot. Then at home, I put together that Portabella Mushroom Burger I wanted to make the other night. 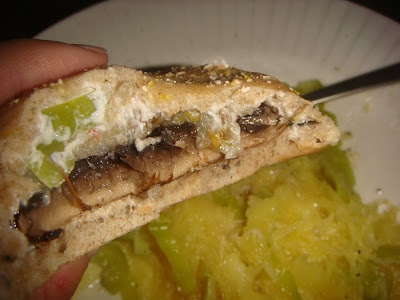 I put the sauteed mushroom on an Arnold Wheat Thin with Goat Cheese, Pesto and Banana Peppers. I ate this with spaghetti squash that I mixed with monterey cheese and salt and pepper. Great filling lunch! After the game, we went to Tasca in Brighton, an amazing tapas restuarant. We ordered about 7 tapas between the 4 of us and sangria...mmmm. 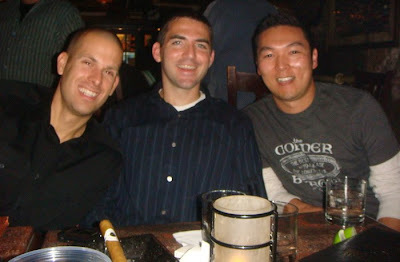 Then we continued drinking at other Brookline restuarants. 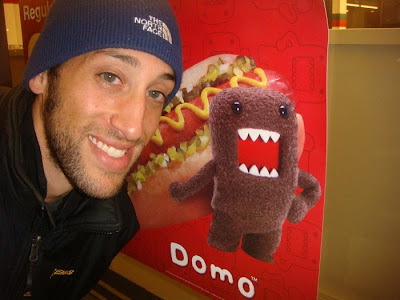 We also made a new friend: DOMO! Today, I went grocery shopping then prepped our dinners and lunches for the week. For lunches, I made Spicy Chili in the Slow-Cooker. (Which by the way does not deserve a photograph- reason #500 I hate slow cookers- they make everything look like mush!) Then I cleaned and sliced mushrooms and leeks, marinated steak tips with teriyaki sauce, sliced up Salmon Fillets and made a spicy honey mustard sauce to go over the salmon and made an Argula Salad with feta cheese, tomatoes and cucumbers. I love being ready for the week! Tonight we drove to Dave's parents house for a nice Sunday dinner in the middle of October with... could it be... SNOW!! It's only October 18th! Dave's mom made an amazing dinner. 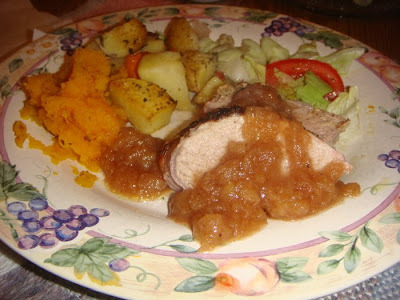 Butternut mashed squash, roasted potatoes and carrots, a salad with homemade Italian Dressing, Peppered Pork Tenderloin with homemade apple sauce. Delicious! So on Wednesday night, I made Crab, Corn and Butternut Squash Chowder inspired by this recipe, but see below for my take. It was a really thick, tasty and filling soup that I loved! In addition, I roasted a spaghetti squash and I made two different kinds of Kale. 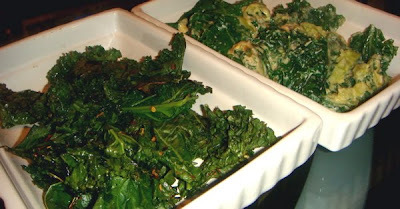 My Kale chips that I eat all the time and my new favorite- Spicy Creamed Kale. 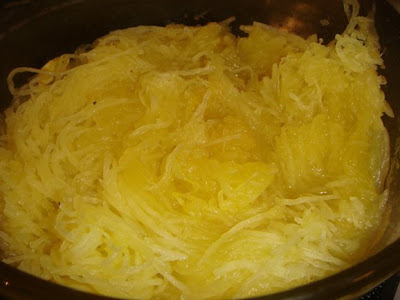 In a large heavy pot, heat oil over medium-high; add squash and onion. Cook until onion is soft, about 6 minutes. Add corn and curry powder; cook until curry is fragrant, about 2 minutes. Season with salt and pepper. Add broth and crab mizture and simmer until squash is tender, about 25 minutes. 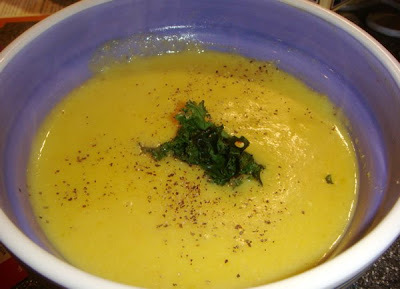 Using a hand immersion blender, blend soup until smooth, leave some chunks. Return to pot and stir in cream; heat through over medium-low. Then add in the Kale and enjoy. Saute Kale on hot skillet with EVOO. Once it has strarted to wilt, add a half cup of mexican blend shredded cheese, chicken broth, light cream and banana peppers. Season with salt, pepper and red pepper flakes. Last night, I had grand intentions of making Portobello Mushroom Burgers with Goat Cheese and Pesto along with taking the Spaghetti Squash I made the night before and mixing it with S&P and Monterey Jack Cheese. But, instead I decided to go out for some cocktails with my department. After I left the bar, I went to 711 and picked up some water. Then I decided it would be a grand idea to eat a bag of Cool Ranch Dirotos. Bad Liz. When I got home at 9, I was pleased to see that Dave enjoyed the burgers. (I had cooked the mushrooms the night before and left a meal kit - leaving the goat cheese, pesto, arnold wheat thins and mushrooms together- so he could make it himself.) He left me one, but I passed and decided to go with the Spaghetti Squash instead. Which I heated up in the microwave with cheese and s&p. Delicious! Then off to bed I went. I had PT this morning and its going well but I am have decided to switch to another office closer to my office that has more morning hours. The guy I am seeing on Monday specializes in Marathon runners so I'm excited to hear what he has to say. I'm psyched about my plan though. Taking a whole month + off from running will allow me to love it again and get excited about training. 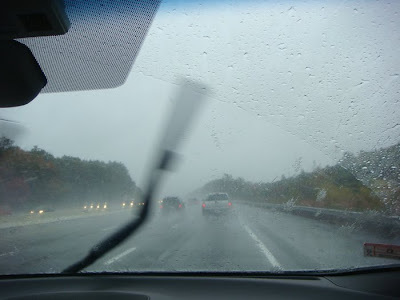 Okay, off to lunch- ps- it's snowing?!?! Well first off, I'm not going to run until December. I am going to take over a month off to heal from this injury completely. Then I will slowly start training and avoid treadmill running as much as possible which means lots and lots of coooold runs. 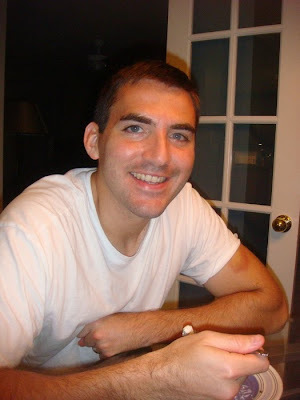 I want to run these races in 2010: The Hyannis Half Marathon on February 28th and the Providence Marathon on May 2nd. 16 weeks out for training would be the week of December 11th, which will be the week to SLOWLY begin marathon training. After the Providence marathon, I will take some running time off and then begin training for the NY Marathon the week of July 4th. So that's my plan. My goal is to run 3-4 days a week with 1-2 days built in for cross training and lifting. I want to continue taking spin and boot camp classes and I won't to stop beating myself up for not running a certain amount of mileage per week. I am going to learn to love running outside by myself and try very hard to avoid the treadmill. So there it is... in writing. That's my goal and I'm sticking to it. Now on to food. So I've written about Robin Miller before, but I love her style of cooking and I use it every week. I think the key to successful meals and cheaper grocery bills is to prep ahead. Over the last month, I've been planning out my menus for the week before hitting the store. Then on Sundays or on this week Monday, I do a lot of the leg work for the week ahead. 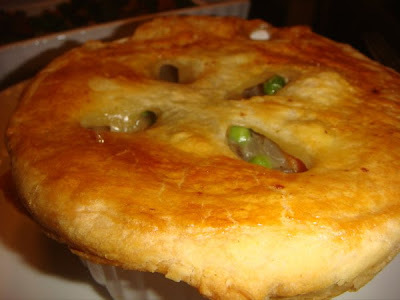 On Monday, I made Chicken Pot Pie, but I didn't mention that I cooked 2 pounds of chicken and cut the pieces into bit size pieces for the rest of the week. 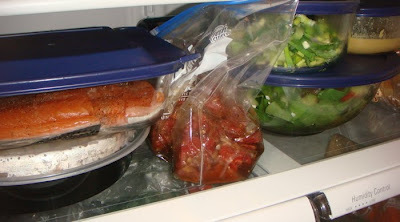 After cooking the chicken and slicing it, I stored it in tupperware in the fridge for Tuesday and Wednesdays dinner. I also cut up my bok choy for Tuesday's dinner. 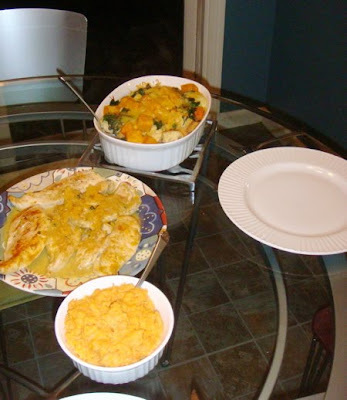 So when I got home last night, I was able to get dinner on the table in less than 15 minutes! 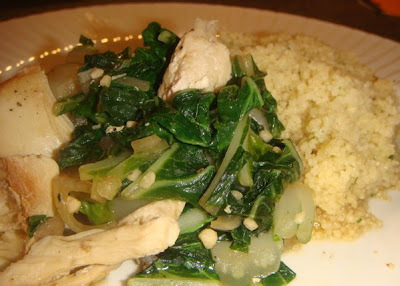 Last night, I made Asian Chicken with Spicy Bok Choy. First thing I did was heat some Peanut Oil in a large skillet, then I added the bok choy and chopped shallots. This vegetable is DELICIOUS. I love greens! Next I added the chicken pieces and got to work on a sauce. I combined chicken broth, tamari, srichi, rice wine vinegar and red pepper flakes together and let it blend together for a nice brothy spicy, tangy sauce. 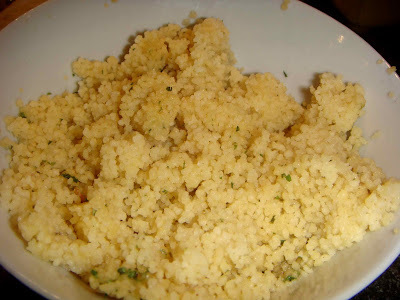 On the side, I made chive cous cous, by letting 2 cups of chicken broth come up to a boil and turning off the heat and adding the cous cous and letting it steam together for 5 minutes. Stephanie and Mike got married!! It was an absolutely beautiful New England fall day and an amazing wedding. Stephanie absolutely glowed. Check her out! Her colors was so pretty and blended perfectly with a New England fall theme. I loved the dresses! For dinner, I got filet and it was delicious and perfectly cooked. Overall, Stef's wedding was so much fun and I was so happy to be part of it! Sunday, Dave and I spent the whole day recovering. And I mean the WHOLE day. I think I slept for 12 hours. Then today, I got to work doing things I should have done the day before. I cleaned, grocery shopped and cooked. 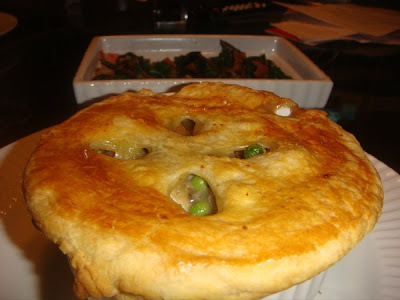 I decided to make Chicken Pot Pie, Rainbow Swiss Chard and M&M Blondies. All of these recipes were inspired by this month's Everyday Food. Preheat oven to 350. In a skillet, melt butter and add onion, carrots and mushrooms and cook for 5-7 minutes. 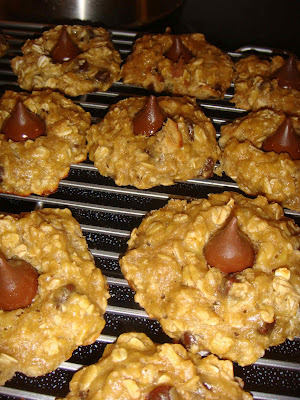 Add flour and salt and stir until the mixture resembles a thick oatmeal. Then add broth while whisking until mixture thickens then reduce to a simmer and cook for ten minutes then add the chicken, peas, thyme and more S &P. Divide mixture into small baking dishes and refrigerate for 20 minutes. Roll out puff pastry with some flour and cut into 4 equal pieces. Lay over the top of the baking dishes and make four slits with a knife. Bake for 30-35 minutes. 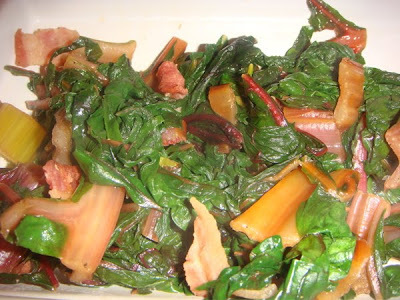 I also made Rainbow Swiss Chard combining chard, EVOO, S&P, chopped bacon and Balsamic Vinegar. And I made Blondies! 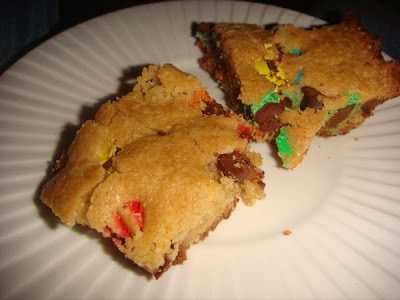 I halved this recipe and instead of just brown and orange M&Ms, I used all of them as well as some chocolate chips. Martha hasn't posted the recipe I just noticed. Its in the latest version of Everyday Food. HAPPY BIRTHDAY TO MY DAVID!!! 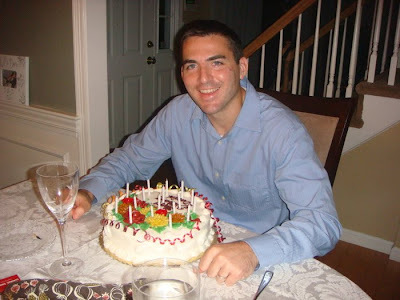 I'm one day late updating this blog, but Dave's 32nd birthday was this weekend and we've been celebrating all weekend!!! 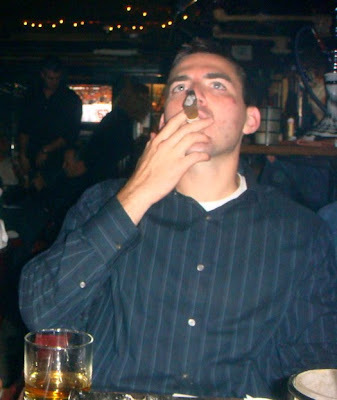 Saturday night we went out to dinner at Fiore in the North End and then went to a cigar bar down the street. 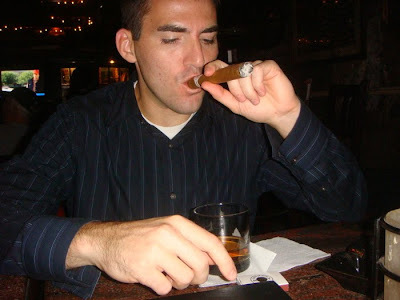 Dave doesn't have many vices but he does really enjoy a glass of scotch (or two or three) and a cigar every once in awhile. (Well the glass of scotch is definitely more than once in awhile...) So when BFF Courtney told me about this place, I figured it was the perfect place to take my old man. We celebrated with our friends Kerry and Jonathan, Usok and Steve. I will admit that I kept looking at my watch because I wasn't drinking and I wanted to get home so I could go to bed and wake up for my morning run. (I know I know, I am lame) I was planning on running with the group at 7. I hadn't run in 5 days and although my leg wasn't feeling better, I wanted to get out there. Unfortunately, waking up at 5am wasn't in the cards for me after not getting home until after 12:30am. Sunday was an insanely busy day. 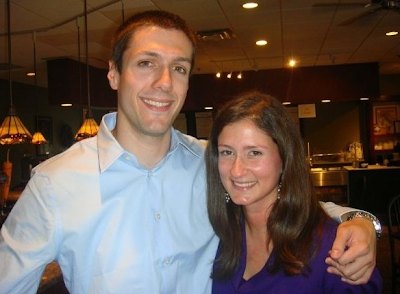 Besides from needing to get in a run, we had an engagement party an hour away AND I planned a family dinner to celebrate Dave's birthday with his parents, my bro and sis-in-law and my mom. So, I woke up at 8am, made a grocery list and went shopping. Then I prepped my dinner which included: bacon wrapped dates, Brie-Prosciutto and Apple Calzone, Deli-Meat Stromboli, Sirloin and Turkey Meatballs, Dave's famous Tomato Sauce and Spaghetti. In addition, my mom made a salad, I made Kale Chips and garlic bread. Dave's mom brought a birthday cake. I forgot to take pictures of the food, probably because I was pretty frantic. When I got home from the grocery store, I put the Stromboli together, prepped all the meatballs, cooked the spaghetti and Dave worked on his sauce. Then at 10:30, Dave and I went running. I'm not sure it was the smartest decision to run, but I did it anyway. My foot is not even close to getting better, in fact the pain has now gone down to my heel, lower achilles area. Dave and I ran 5.33 miles in 49:48. When I got home, I iced and finished prepping my dinner. Then I got ready for the party and we drove down to Brockton to celebrate Dean and Joanna! Joanna is one of my oldest friends. We met at camp over 10 years ago and we were never in the same bunk (until my last year) but we became pen pals. I love when you are young, you are pen pals with people who live in the same state as you! 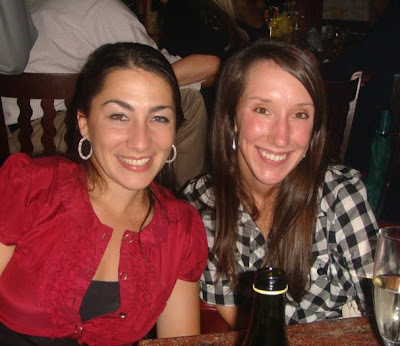 Anyway, when Joanna and I first graduated college, we hung out all the time. Both of us were living the single life and trying to forget about the past. I met Dave first and soon after I met Dave, Joanna met Dean. And we've never looked back! And although Joanna and I don't hang out nearly as much as we used to, I know we will remain life long friends. 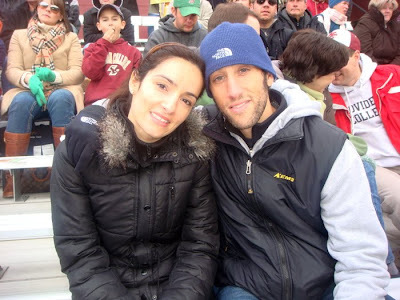 So here's to you Dean and Jo- Congrats on your engagement- can't wait until next year! I love you! Okay so after the party, we rushed home to get to our house before Dave's parents arrived so I could finish cooking. I was rushing and felt kind of frantic but I got dinner on the table. It is not easy to get everything hot at the same time, especially when you are cooking so much and only have one oven! 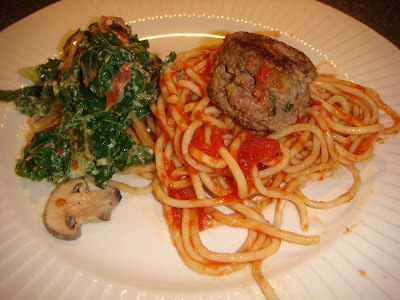 Spaghetti and Meatballs is not my favorite meal but it's Dave's and since it's his birthday, I let him pick! After dinner, we had cake... mmmm... cake. Monday, my leg felt pretty terrible and I was starting to get really worried. Honestly, I didn't sleep well thinking about what will happen if I can't run this race. I called Children's in the morning and figured out if need be, I can defer my number to next year and I have until the 25th of the month to decide. I'm worried about not running leading up to the race but I haven't given up hope. I've taken this week off so far and will run on Friday and see how I feel. I'm hoping for the best but expecting the worst. Tonight we ate more the spaghetti and meatballs. 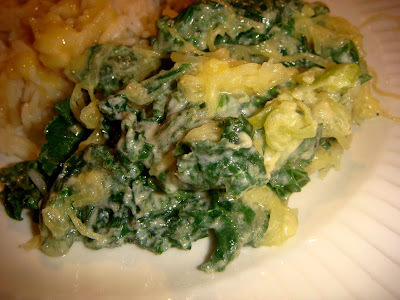 I also made this AMAZING dish of Creamed Kale. I made it up on the fly but it was an awesome side-dish. I put a ton of Kale with a little EVOO in a hot skillet with chopped proscuitto, portobella mushrooms, 1/4 cup of cream, 1/8 cup of Chicken Broth, shredded mexican cheese, salt/pepper and red pepper flakes. I promise I will post the recipe of the sauce and meatballs, but not tonight! Now I'm off to watch the Celtics and get to bed early. Tomorrow is going to be an insane day in the office.